Since Chelsea let in six goals yesterday, here’s six Blues flops we think need to be sent packing by the club this summer. Of course, we’re aware it’s probably far more likely Maurizio Sarri will be the one heading out of Stamford Bridge before any of this lot, such is Roman Abramovich’s record with hiring and firing managers. Still, we’re of the view that the struggling Italian needs at least another season at Chelsea to put his philosophy into place – it worked wonders for him at Napoli, and Pep Guardiola suffered a similarly slow start at Manchester City. A player who had one fine season under Antonio Conte when he first joined, but who has been horribly exposed since. Better as a wing-back, Marcos Alonso is now showing his defensive deficiencies after being moved to left-back by Sarri, and the Spaniard just really isn’t coping. Click here to see how much he messed up for the opening goal from Raheem Sterling yesterday as fans ripped him to shreds for the error. Apart from a brief purple patch earlier this season, Ross Barkley has never really looked good enough to be a player for a club like Chelsea. The England international had a nightmare against City, with one of his mistakes leading directly to a goal. 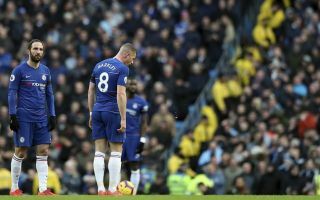 It wasn’t so long ago Chelsea had big names like Frank Lampard and Michael Essien running their midfield, or more recently Cesc Fabregas, but Barkley is just nowhere near that calibre and needs to go. Surely past his best now, David Luiz has looked horribly exposed in recent away games for Chelsea. Like Alonso, the Brazil international is another player whose flaws were hidden in Conte’s system of three at the back. With just one other centre-back alongside him, Luiz just doesn’t look the same player, and at this stage of his career it’s surely time to give up on him improving any time soon. Willian is a regular target of Chelsea fans’ wrath, with the Brazilian winger doing little to justify his continued selection ahead of the likes of Pedro, or of promising young winger Callum Hudson-Odoi. Linked with an exit from Chelsea for some time, surely this summer will be the moment the Blues decide to finally cash in on the player who bizarrely still seems to attract interest from big clubs. The Daily Mail linked Willian with Paris Saint-Germain in January – have they seen him play this season?? Maybe this is harsh, but Kepa Arrizabalaga already looks a flop signing for Chelsea after being thrust into the spotlight in the Premier League. Still relatively young and inexperienced, it was never likely to be easy for the Spaniard to come in and replace a big name like Thibaut Courtois as number one for a leading European club. Unconvincing on so many goals Chelsea have conceded now, Kepa may be one to shift out this summer if a better option does become available. A bit of a forgotten man at Chelsea, Olivier Giroud hasn’t played much and doesn’t make much of an impression when he is used. Even when Alvaro Morata was being ushered out by CFC, it was Eden Hazard who got the nod up front over Giroud, while the signing of Gonzalo Higuain surely ends his realistic first-team hopes. The France international might have something to offer other clubs in the Premier League, but he’s just not the answer for Chelsea now and probably never will be.